Fast food chains are spending a fortune to pull in customers from an early age, and it’s working. A new study from Dartmouth has determined that pre-school age kids who are exposed to fast food marketing are more likely to want to eat burgers and nuggets. Estimates put the amount of money spent on food advertising aimed at children and adolescents at no less than $1.6 billion dollars. And, in what turns out to be a related statistic, according to the study, 1 in 5 preschool children in the U.S. are obese. "In general, children's consumption of fast food is associated with increased intakes of calories, fat and sugar, making fast-food consumption an important risk factor for obesity and other health problems," Madeline Dalton, PhD, lead author on the study, said in a statement. "We also know that dietary practices that are formed early in life are carried throughout adolescence and adulthood." This is the first study to link child-targeted fast food advertisements and an increase in fast food consumption in this age group. Researchers studied 548 families with a preschool age child—usually around 4-years-old—over a period of 9 months. Using a written survey during visits to a Dartmouth pediatrician, the parents detailed how long their children watched television, what channels they watched, and how much fast food their child ate that week. Their responses were then compared to a list of advertisements aired by McDonald’s, Subway, and Wendy’s during the same time period as the study. McDonald’s “accounted for almost three-quarters of TV advertising exposure,” the study’s authors wrote. Forty-one percent of the surveyed kids were exposed to the ads, while 43 percent ate fast food in the week before they were surveyed, overall, whether they were exposed to the ads or not. 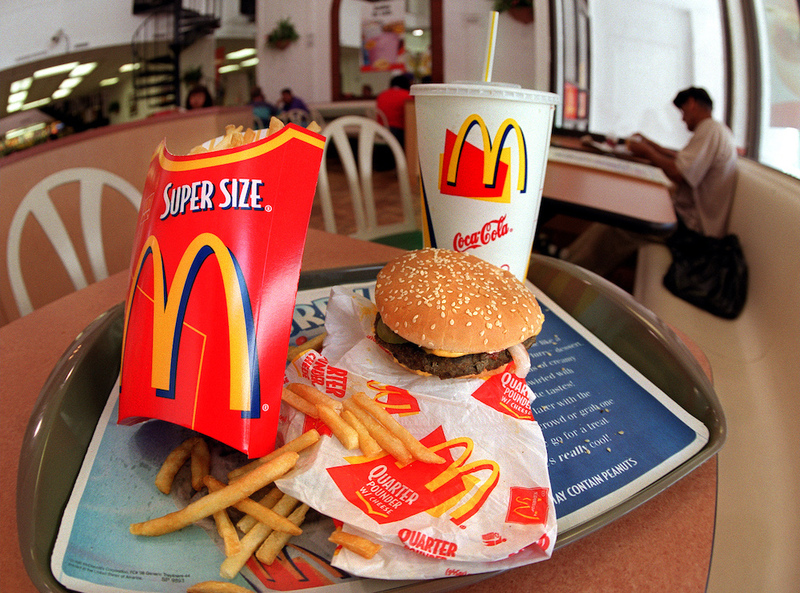 The researchers found that, “Children with moderate and high levels of McDonald’s ad exposure were 38 percent more likely to have eaten at McDonald’s in the past week compared with children with no exposure.” Not only did McDonald’s take up the majority of advertising space, but the chain also accounted for 79 percent of the surveyed children’s fast food consumption. Kids who had even a moderate exposure to the ads were 30 percent more likely to eat fast food than those who hadn’t seen any ads, and this percentage stayed the same regardless of how long they watched television, as well as “the frequency with which their parents ate fast food, and other factors like socioeconomic status." In this particular project, measurements were not based on how often parents took their kids to eat fast food of their own accord—a limitation of other studies on this subject, according to Dr. Dalton. “[This study] was independent of parent fast food consumption, which means that either the kids are going to the restaurant with another [kid’s] parents, grandparents, another relative, or child care provider,” she told Food & Wine. If you’re a parent who is worried that your child is being taken advantage of by fast-food advertisements, the researchers recommend only letting them watch channels specifically tailored to preschool aged children, which do not air ads. Fast food ads have already been linked to rising obesity rates, so for Dalton and her colleagues, their research was an important connection to make. “These results are particularly sobering given that participating children were less than 6 years old and therefore are cognitively unable to defend against advertising,” the study concluded. So if you're concerned that your family eats too much McDonald's, the best thing to do might be to avoid the television.